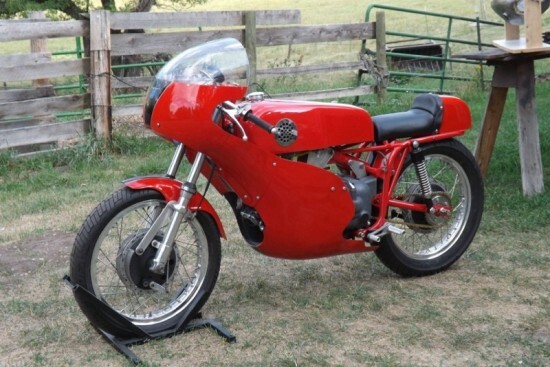 This 1968 Aermacchi CRTT replica strikes me as having a very clean look with flowing lines. When the seller says that they had built this to go Land Speed Racing, it both surprised me and explained the slippery look. Built to emulate a road racer, but re-purposed to go as fast as possible on an expansive Salt Flat. When I saw the listed location of the motorcycle, I was wondering how does a road racing bike end up in Montana. 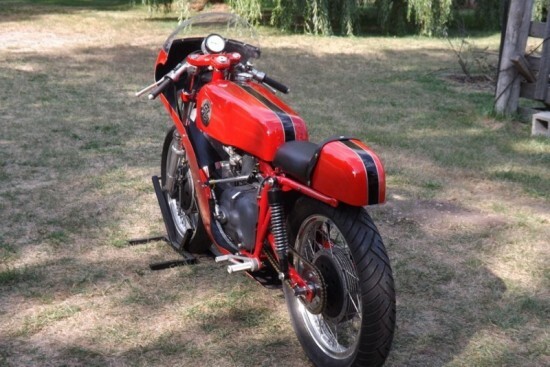 Then I see that a trip to Bonneville was in this bikes future, it made more sense. Throughout the US, Canada and the World, garages are filled with vehicles that will only ever race on salt, and no other track or drag strip will contain these Land Speed Racers. The engine is a fresh Ron Lancaster built 250 short stroke, which has only been started, no miles. 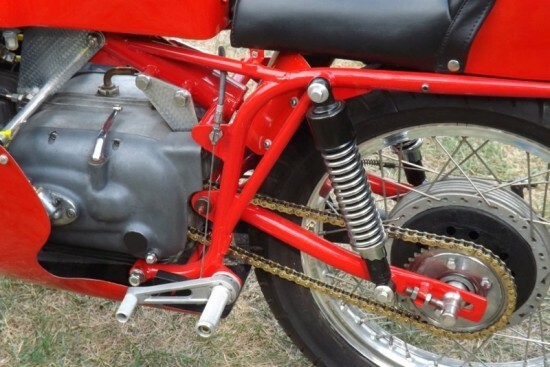 Carburetor is a Del’Orto SS1, 30mm. Engine covers are factory team issue magnesium. I do not have a “build sheet” on the engine but the purchaser (or prospective purchaser) can contact Lancaster for details, if needed. Front and rear brakes are ex-factory team Oldanis, magnesium, with correct Borrani wheels, stainless steel spokes. I have been told that only 44 sets of these magnesium Oldanis were ever made, with 32 sets going to the original factory race team bikes. This front brake has been relined and set up by Vintage Brakes. Rear brake linings are new. 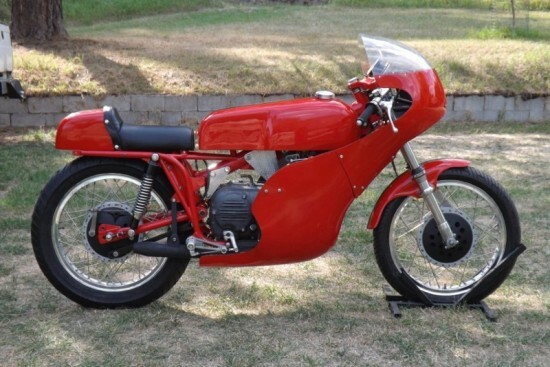 Aermacchi first offered the CRTT (Competition Road) in 1961 with a long (under square) stroke motor, with the stroke being longer then the diameter of the piston. This traditionally offered more torque, but fewer peak RPM’s. 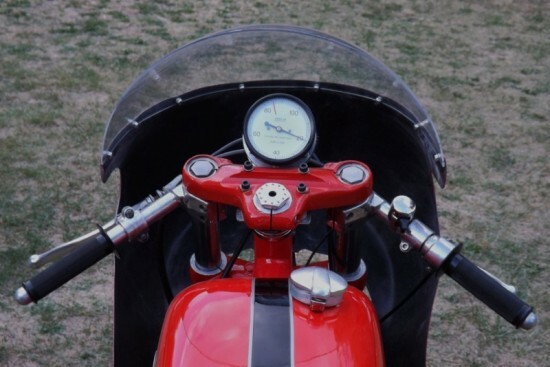 By the end of production in 1968 the engine became a short stroke, or over square. In 1965 I found that the 250cc engine produced 28hp at 9500 rpm, and at Daytona the CRTT would reach 107mph down the straight. Even though the altitude at Bonneville effects engine tune, with effort and the right gears, I wold imagine that the Daytona top speed could be beat. 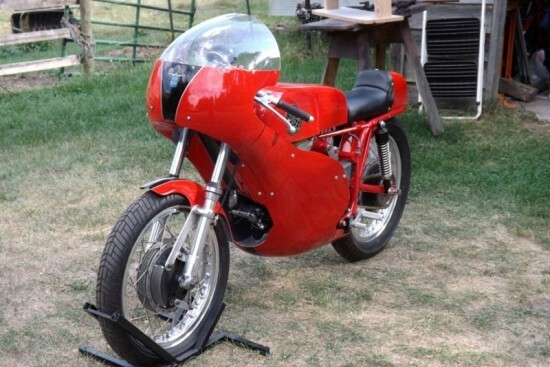 In short, what we have here is a race-ready CRTT built from frame up without regard to cost, by an obsessive-compulsive, artistic Italian who is known for his motorcycle builds, and his custom racing bicycles….There has been, literally, no expense spared in building this motorcycle….This bike was being prepared to run at Bonneville in the BUB Trials but reality has interfered with that plan, so it’s reluctantly up for sale.